This is a partial listing of this cemetery. Many names were sent in by Samantha Miley and Karen Nance. Karen also sent in many all pictures unless otherwise noted. If you have anything additional you would like to add or better yet the full cemetery listing, please let Marsha know. NC means not carved. 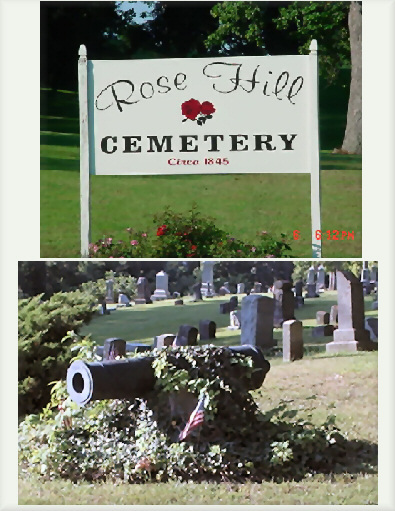 Rose Hill Cemetery is located on State RD 261 in Newburgh. It is the final resting place for many of the founding fathers. Vincennes Land Office records show the land upon which Rose Hill now stands was sold by a government land grant to SUSANNAH FUQUAY in AUGUST 1832. Although burials are recorded on the land as early as 1828. In 1872 eleven acres of the tract of land were deeded to Rose Hill Cemetery trustees J R TILLMAN, ALFRED ABSHIER, WM FOLZ, UNION BETHELL and THOMAS GUNNELL. 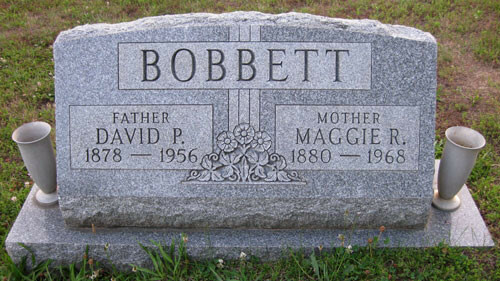 Many of the town's early residents were removed from MYRTLE RIDGE and interred at ROSE HILL. The cemetery enjoys a wonder of stately monuments to some of the better-known citizens of Newburgh. Over the years the cemetery trustees have made additional purchases of land bringing the total to 27 acres of land that make up this place of solitude and serenity. It's reported that ELIZA FOSTER deeded an acre to the trustees so as to reserve a resting plot for RALPH FOSTER. There are two MR. RALPH FOSTER'S interred at Rose Hill and one at Myrtle Ridge. Many families having the forethought to purchase several plots in advance to secure a final resting spot for themselves as well as family members. Some of these families were ADAM YOUNG January 1 1834 to July 1 1910 his wife KATHRINE November 20 1832 to July 5 1908 and other members of this family to include JOHANN, FRANK, MANNELIUS, NORMA, CARL and JOHANN S.
FRANZ BRIZUIS May 11 1826 to June 11 1904 his wife KATHARINA April 15 1830 to May 12 1994 and other members of this family to include GEO H, CLARA, EMMA, FRANK and GEO AUGUST BRIZUIS. SAMUEL WEED April 21 1818 to January 12 1892 and 1st wife REBECCA February 26 1813 to May 8 1849, 2nd wife ANNA December 6 1811 to September 26 1888, but not his 3rd wife MARRYING POLLY, Mary Ann "Polly" CASTLE. Although other members of this family to include JAMES R, GEO, ZACHARY, STEPHEN, MARGARET, and WM W WEED. WM W WEED the brother to SAMUEL. Just to name a few other founding families to include, PEPMILLER, BETHELL, PHELPS, SMITH, KOCH, FRAME, MUELLER, WELDON, LEACH, SPRINKLE, WILDER, DARBY. Abraham, Dorcus d. 16 Aug 1865, 62years w/o J.
Abshier, Helen 1838-1909, Mother- Reb. Abshier, M. Dora 1863-1925, Mother- Reb. Akin, Almond H. Buck 1912-1994, husband of Helen F.
Akin, Helen F. 1914-2010, wife of Almond H.
Allen, Henry CO C 100 U.S.C.T. Anderson, Louisiana d. 11 Sept 1893, 24y 11m 28d, w/o John L.
Anderson, Pickney CO H 25 IND INF. Angel, Leona M. 1867-1945 M.
Angel, Patsy Ann 1935-1951, "Pat"
Anstey, Lorraine J. Jun 8, 1920 - Jun 25, 1989, stone with A. W.
Barclay, Bernard N. Dec. 13, 1896 - Aug. 18, 1977 shares stone with Myrtle I.
Carrell, Doris I. 1935-NC, stone with Jerry D.
Curtis, Henrietta 1890 - 1950, shares stone with John R.
Elder, Louise 1900-1984, stone with Sam T.
Feldman, Charles A. 1876 - 1912 shares stone with Cora B.
Forston, Lula M. 1907 - 1990 shares stone with Gurley F.
Gardner, Ada J. 1869 - 1925, Mother - shares stone with Jno. A.
Gardner, Arthur I. 1890 - 1952 shares stone with Mary L.
Gardner, August 1886 - 1889, Son of Homer - Eliz. Gardner, Irvin L. 1888 - 1949 shares stone with Bessie M.
Gardner, Jacob P. 1900 - 1978 shares stone with Opal M.
Gardner, John L. 1895 - 1990 shares stone with Laura I.
Gardner, L. Henry Apr. 15 - Oct. 25, 1890, Son of Homer - Eliz. Gardner, Mary J. 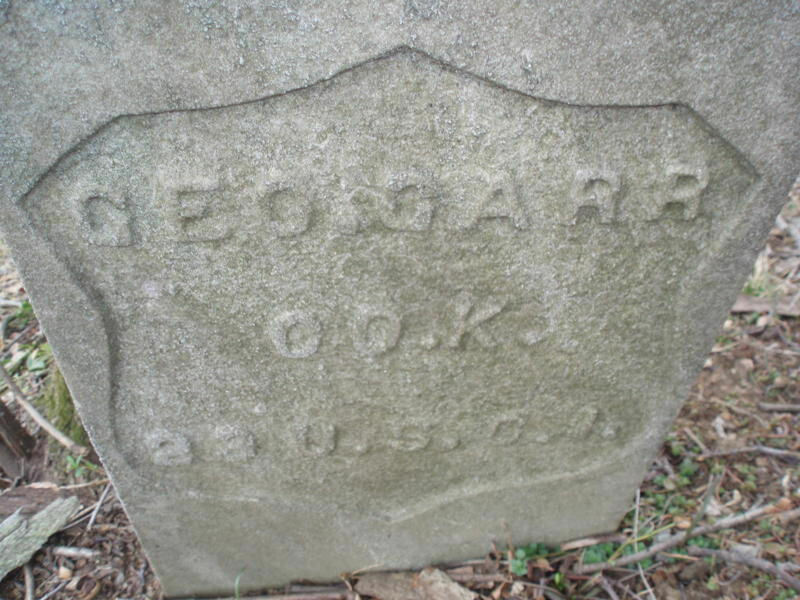 1844 - NC, Wife of James L.
Gardner, Mary L. 1892 - 1959, shares stone with Arthur I.
Gardner, Norman W. Feb. 16, 1914 - Mar. 20, 1993 shares stone with Helen H.
Gardner, Unie F. 1893 - 1968 shares stone with Golda B.
Gardner, W. H. H. Oct. 6, 1834 - Jan. 4, 1900 shares stone with Julia F.
Hancock, Mildred L. Jan 17, 1934 Mar 5, 1989, stone with John B.
Hill, Ernest Jun 21, 1919 - Aug 24, 2003, husband of Ruby D.
Hundry, Emma T. Jan 1 1908 Apr 6 1985, stone with B.
Hurley, Roland L. D: Dec 19,1945, Paper 12-28-48, Graduate of Newburg High, Cpl. KIA iw Jima USMC. Purple Heart~ Presidential Citation, Mother:Ms. Hallie Murphy, Father: Barnum Hurley, Sister: Mollie Hurley, 1/2 Brother:Edward Hurley, Grandparents: Mr.and Mrs. Ben Shekel, -Ms. John Retter-Uylesses Hurley, Note: Ms. Hallie Hurley lost her home on Christmas Eve. in a fire.